Black ops operative Sam Fisher of Tom Clancy's Splinter Cell series comes to Ghost Recon: Wildlands for a mission. Earlier, we learnt of a crossover between two of Tom Clancy's most popular game title from developer Ubisoft where Splinter Cell's Sam Fisher comes to Bolivian Wildlands for a mission and teams up with the Ghosts. Thus, video game fans are receiving a company-wide crossover of tactical shooter Ghost Recon: Wildlands and stealth game Splinter Cell. Sam Fisher will arrive at Wildlands in the next free update Special Operations 1 for one of his black-ops missions. Second season for Ghost Recon: Wildlands have already kicked in and Ubisoft plans to release four free updates. 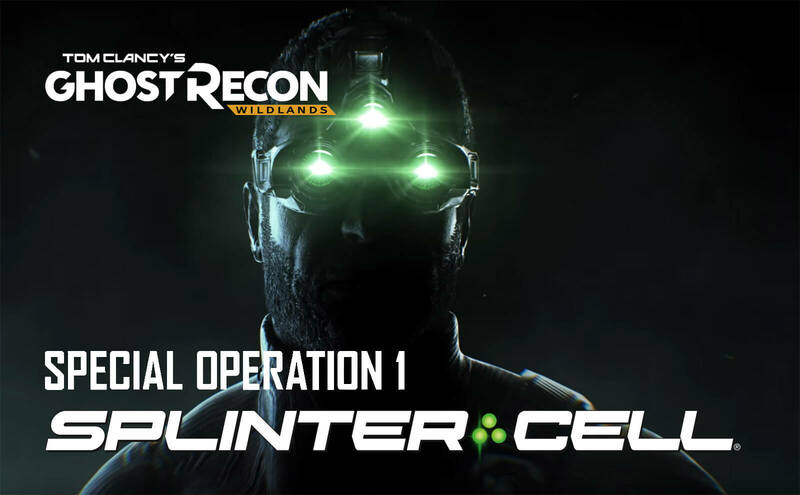 Special Operation 1: Splinter Cell is the first one of them and from onward April 10, will go live for PC, PlayStation 4 and Xbox One. There will be new PvE missions, brand-new PvP class and Splinter Cell-themed items. Few details from developers have been dropped about this operation and we are discussing it below. We got a trailer highlighting features of Ghost Recon: Wildlands Special Operation 1: Splinter Cell that marks the return of Sam Fisher. Available for single player or four player co-op, this Splinter Cell-themed mission is fully stealth based and you will be accompanying Sam during night time into enemy camps to complete his quest. 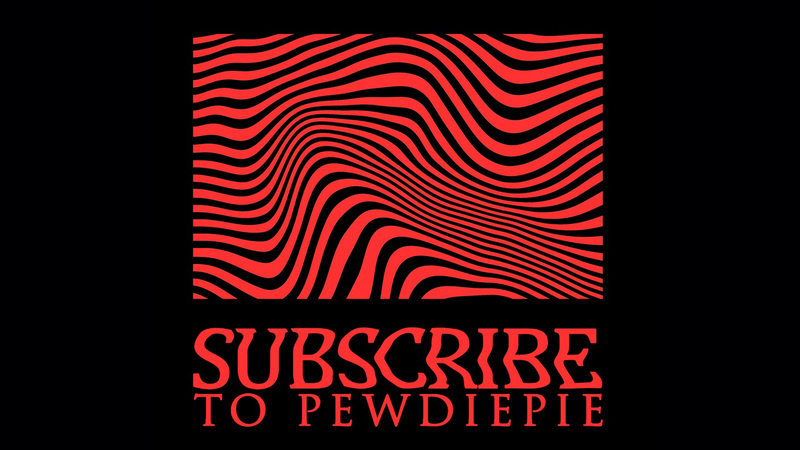 Be mindful of the fact that this is a limited time exclusive and you have to finish the mission before May 2, 2018 to get your hands on special items like night-vision filter or filter goggles which Sam Fisher uses and a few other cool stuffs. A new assault class Echelon is also added in this free update for PvP modes of Ghost War. This one is part of Sam's Fourth Echelon team and has access to fancy gadgets such as Sonar Pulse, which will let you see enemies at close range from behind the walls. 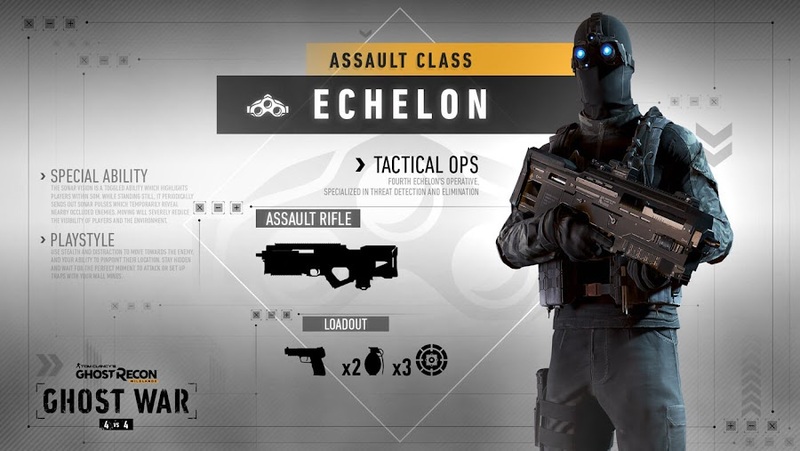 Year 2 Season Pass of Ghost Recon: Wildlands can get you seven-day early access to Echelon class or you can purchase it with your hard earned Prestige points. This class is also available in new PvP game mode Sabotage that has five exclusive new maps. RELATED: Splinter Cell Upcoming Reboot? Special Operation 1 will help improve Ghosts' stealth skill as they follow legendary Sam Fisher in the field at work. These new challenges will make them more tactical, which actually helps because Ghost Recon: Wildlands is a tactical shooter. It wasn't quite long ago when 90's renowned movie monster, The Predator came to tangle with the Ghosts in a PvE mission. Although he was a bit hard on the elite squad and gave them a tough time, they sure learned a thing or two going up against him. Months ago, we heard a rumor flying of Splinter Cell franchise getting a reboot and we still got no confirmation on that. 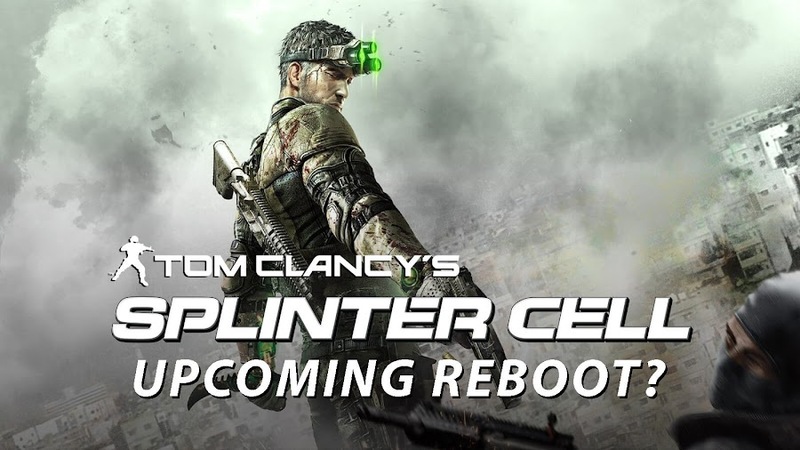 However, we are glad that Sam Fisher has found a way to come back in action once again even though if it is for a crossover. Voice actor Michael Ironside also returns to portray this iconic character of the series. We might even see him working with special agents of Tom Clancy's The Division in mid-crisis Manhattan of the future shortly afterwards. One of Ubisoft’s old crown jewel was the award-winning stealth video game series of Splinter Cell and it truly set a landmark upon its debut in 2002. The franchise gave us some pretty good story of black-ops agent Sam Fisher and unbelievable stealth in gameplay, which made the series into the legend it has become; spawning games like Chaos Theory and Pandora Tomorrow. The last game of the Tom Clancy's Splinter Cell series was released five years ago from now and that was 2013's Splinter Cell: Blacklist. 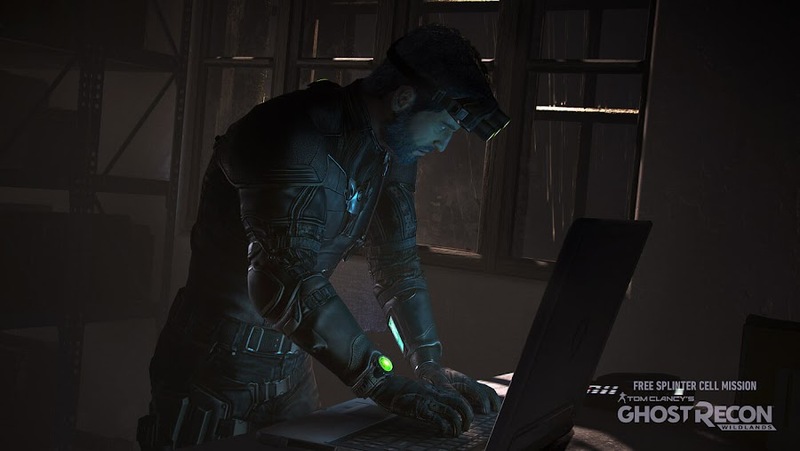 The game took a slightly different path than the other titles of the series and replaced Michael Ironside as voice actor for protagonist Sam Fisher. 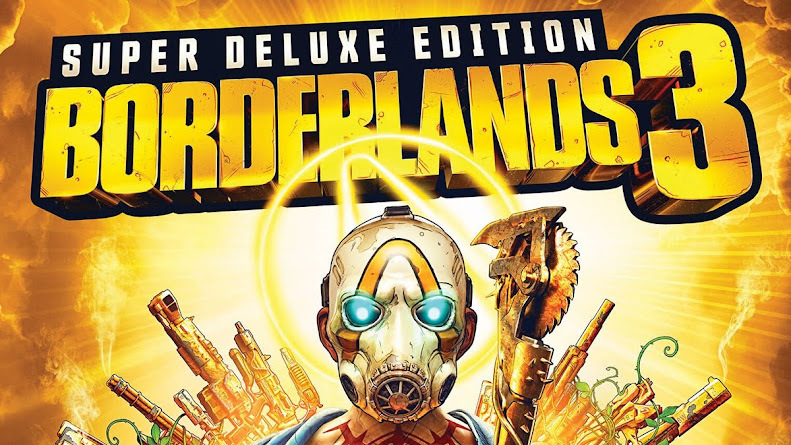 Not surprisingly, the game heavily under-performed and Ubisoft was not quite happy with the reception it got. So, considering these facts they shelved the project and moved on with a Splinter Cell movie adaptation but even that faced some trouble with scripts. 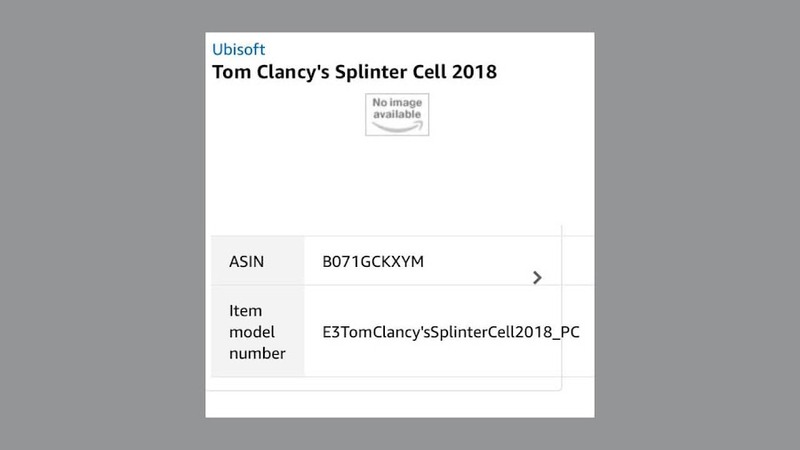 However, fans of the Splinter Cell series may rejoice a little as an apparent Amazon listing of Tom Clancy’s Splinter Cell 2018 showed up under Ubisoft for a very brief time and eventually taken down even sooner. Before the takedown, a Reddit user named HurtPotato was able to take evidence for the internet. 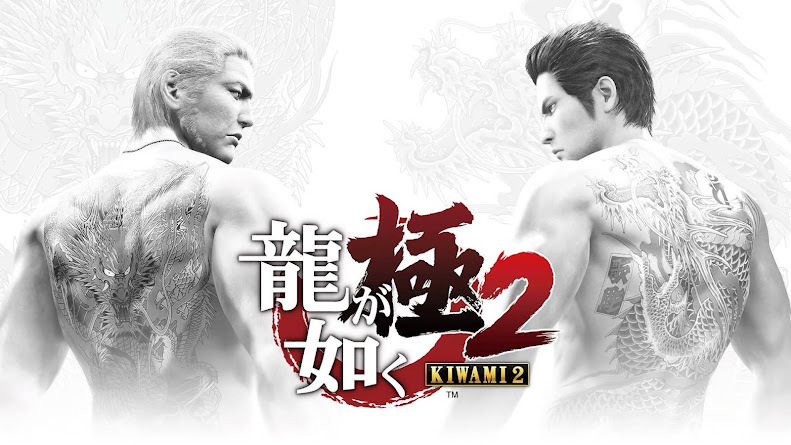 The game will most likely be released for PC, PlayStation 4 and Xbox One, while a Nintendo Switch version is uncertain. Since E3 2018 is getting very closer, we can only assume that Ubisoft just don't want to reveal anything at all before they do on that big event. That means, fans of the franchise can expect official news regarding Splinter Cell this summer and at this point an E3 reveal would only make sense for a game that has been on a hiatus for this long. Because, we definitely are not going to have another Assassin’s Creed game this year after Assassin’s Creed Origins and Ubisoft will look for something to fill in. Last year at E3, Yves Guillemot, CEO of Ubisoft stated that they haven't forgotten about Splinter Cell in response to a question regarding the future of the series. Looks like things are all adding up themselves and we just need some official announcement right now. We hope that the developer make a great comeback in 2018 with the newest Splinter Cell title. Also, we are hoping to get some better look at upcoming The Division 2 that was announced a few days ago.